The federal budget deficit hit a record $374.2 billion in 2003, the administration reported Monday, as the costs of the war in Iraq, a new round of tax cuts and economic weakness pushed the government's red ink to the highest level in history. Providing a final accounting of the budget year that ended Sept. 30, the administration said that the 2003 deficit was more than double last year's imbalance of $157.8 billion. In dollar terms, the 2003 figure easily surpassed the old record of $290.4 billion set in 1992 when President Bush's father was president. 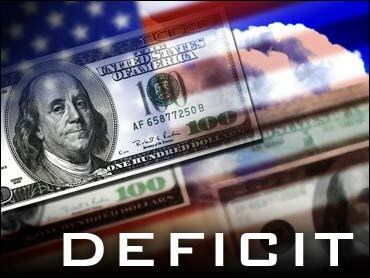 However, Bush administration officials noted that the 2003 deficit represented just 3.5 percent of the country's total economic output, below the 5 percent and 6 percent levels hit in the 1980s during the Reagan administration. The administration prefers to link the deficit to total economic output as a better measure of the country's ability to carry the debt burden. The $374.2 billion deficit figure represented an improvement from the administration's forecast this summer when Bush officials projected the deficit this year would hit $455 billion. Officials credited stronger-than-expected tax collections in recent months in combination with less government spending for the improvement over the summer forecast. Still, Joshua Bolten, head of the president's Office of Management and Budget, said that the deficit for the current 2004 budget year will rise even higher, topping $500 billion, before stronger economic growth will start the red ink on a downward path. The administration is forecasting that the deficit will be cut in half over the next five years. "We can put the deficit on a responsible downward path if we continue pro-growth economic policies and exercise responsible spending restraint," Bolten said in a statement accompanying the budget figures. "The president's budget does precisely that, halving the deficit from its 2004 peak within five years." The back-to-back deficits in 2002 and 2003 represent a significant turnaround in the country's fiscal fortunes after four consecutive years of budget surpluses. That was the longest such stretch since the 1920s, as government coffers were swollen by rising income tax revenues, reflecting the record-long 10-year economic expansion which ended with the recession that began in March 2001. That recession and weak economic growth since then, plus three rounds of tax cuts pushed through Congress by the president and rising government spending to bolster homeland security and fight a global war on terrorism have sent the deficits soaring. Democrats have zeroed in on the deficits as a symbol of what they contend is Mr. Bush's mismanagement of the economy, arguing that the president's emphasis on tax cuts has squandered projected surpluses totaling $5.6 trillion over 10 years. But administration officials said Monday that Mr. Bush's policies were beginning to spur economic growth, which many analysts believe will top 4 percent at an annual rate over the last six months of this year. "Today's budget numbers reinforce indications we have seen for some months now; that the economy is well on the path to recovery," said Treasury Secretary John Snow.